and mentioning Nettel lenses and binoculars. Nettel Camerawerk was a cameramaker in Sontheim am Neckar, in southern Germany. The company was founded by Robert E. Mayer and Max Körner in 1902, as Süddeutsches Camerawerk Körner und Mayer. It was renamed Camerawerk Sontheim in 1904, and again to Nettel Camerawerk in 1908. It was famous for its patented Nettel strut folding cameras, with focal plane shutters. When such a camera is unfolded the extension of the scissor struts can be adjusted with a knob or lever for focusing. The Deckrullo-Nettel strut folders were an improvement on this range of cameras, with a focal plane shutter which is self-capping, i.e. light-tight during tensioning; (Deckrullo; Deck meaning cover, combined with rouleau shutter). 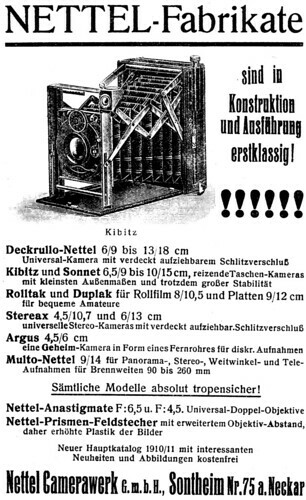 The Deckrullo-Nettel and other camera models were continued when Nettel was merged with Drexler & Nagel into Contessa-Nettel in 1919; some models were still produced after Contessa-Nettel was merged into Zeiss Ikon in 1926. ↑ McKeown, James M. and Joan C. McKeown's Price Guide to Antique and Classic Cameras, 12th Edition, 2005-2006. USA, Centennial Photo Service, 2004. ISBN 0-931838-40-1 (hardcover). ISBN 0-931838-41-X (softcover). p712. ↑ 6.5x9 cm Körner and Mayer Nettel, about 1903, with an 10.5 cm f/3.8 Meyer Trioplan, sold at the fourth Westlicht Photographica Auction, on 22 November 2003. British Patent 15519 of 1903, Improvements in Photographic Camera Apparatus, granted to Max Körner and Robert Mayer, at Espacenet, the patent search facility of the European Patent Office. The patent describes a mechanism for adjusting a camera to take either roll film or plates without moving the lens. This page was last edited on 19 January 2018, at 11:29.